Armenian leadership itself is entangled in its statements and actions. From one side, Armenia states that it is ready for constructive dialogue, and from the other, its acting prime minister Nikol Pashinyan visits occupied Karabakh - an action which can only be viewed as another provocation. 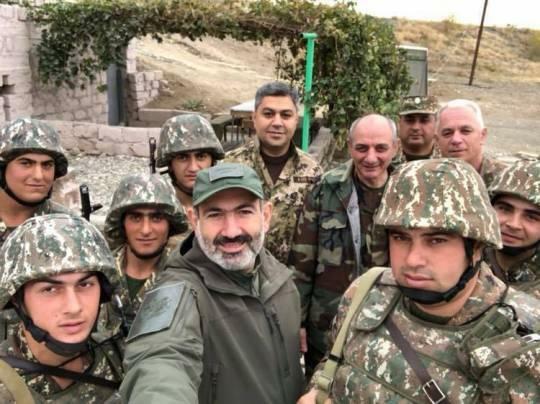 Nikol Pashinyan visited occupied Karabakh on November 4, and continued to tense the situation by posting selfies from the contact line of Armenian-Azerbaijani troops on the occupied territory of Azerbaijan. He signed the photos “Our name is Armenian Army”. The leader of Armenia came in occupied Azerbaijani lands on a short-term vacation and was accompanied by the head of the so-called separatist regime Bako Saakyan, director of the Armenian national security service Artur Vanetsyan and others. Pashinyan talked to the soldiers and made a selfie with them. “The cases of ceasefire violations are minimal, mostly non-targeted, and, in fact, I can say that the agreements are not fully implemented, but are respected. In any case, we must be ready for any development of events. There are problems that seem to be solved, but we must learn from the soldiers whether they are solved or not. If we do not discuss the issues openly, then we will have problems with their solution,” said Pashinyan. The Prime Minister of Armenia talked with the servicemen, heard the opinion of the commanders and ordinary soldiers on various issues. Pashinyan assured that everything will be done primarily for the convenience of the soldiers. However, instead of solving everyday problems of soldiers, Pashinyan would better take active measures in the settlement of the conflict. Moreover, there are much worse problems in Armenian army, where the number of murders keeps increasing every month. It is noteworthy that after this visit, KamAZ of the Armenian Ministry of Defense got into an accident at the 39th kilometer of the Goris-Kubatly highway on November 7, that killed four 20-year-old soldiers. Six soldiers got fractures, two of them will be transported to a military hospital in Yerevan. Among the causes of the tragic accident is a technical malfunction, as well as omissions in the organization of the service, according to preliminary data. Armenia’s problems are not limited to this. Parliament of a country had dissolved, there is no prime minister, but there is an acting person who is on vacation, and still, Armenia lost her man in the chair of the CSTO Secretary General. And all this is against the background of growing social and economic problems, as well as a lack of a feeling of confidence that someone will support Armenia on the path of democracy. Moreover, presidential adviser on national security, John Bolton, while in Yerevan, spoke openly with pro-Azerbaijani positions. In addition, Russian Foreign Minister Sergey Lavrov gave a press conference in Moscow and, in fact, threw a huge rock into the garden of Nikol Pashinyan. Lavrov declared that in order to change the current bilateral format, the consent of both parties is required. However, there is no such agreement. So, it is wrong to put forward preliminary conditions in order to begin to consider the substantive approaches to the Nagorno-Karabakh settlement. Well, for now, Armenia can only brag about numerous Pashinyan selfies.